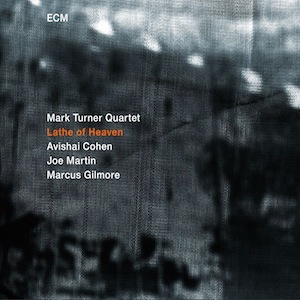 Tenor saxophonist Mark Turner debuts for ECM here on a set that respectfully evokes the spirit of mid-1960s Miles Davis and the acoustic recordings Wayne Shorter with a deliberately pared down setting. In reality Turner is anything but a novice for ECM having recorded on several albums as a sideman including Billy Hart, Enrico Rava and the latest Stefano Bollani that was recently reviewed in this column. The quartet has comprises Avishai Cohen (not to be confused with the namesake Israeli bassist), Joe Martin on double bass and drummer Marcus Gilmore. If the six pieces are lengthy (none less than eight minutes and one at just under thirteen), then they are nonetheless beautifully constructed. On the title track and opener, there is a full frontal attack by the leader which contrasts with the lengthened out notes of Cohen, but both combine with the catchiest of hooks on the chorus. In a more laid back vein is the lovely bossa-infused bass line of ‘Year of the Rabbit’, which is a title in direct reference to the ECM album by Fly from 2012, ‘Year of the Snake’. An ode to Stevie Wonder is paid on the pared down ballad ‘Sunset for Stevie’. In general this is chamber jazz music of the highest quality and a debut album that takes the listener on at times an unknown, yet utterly fascinating journey. The title of the album, by the way, is a reference to a 1971 Science Fiction novel by K. Le Guin.